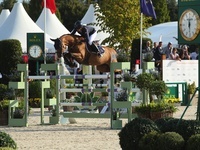 The horses jumped great in the CSI3* Top Series at Brussels Stephex Masters this weekend. Etna was 8th in the opening 1.40m class, and went on to place 3rd in Thursday's 1.45m world ranking class. Elien placed 9th in her first class, and then jumped to a 3rd place in Friday's 1.45m world ranking class. In Sunday's Grand Prix, Elien got a very light and unlucky fault in the first round but still placed 11th. After a very good weekend, Kathi ended 2nd on the Leading Rider Top Series standings. The next show for Kathi will be the CSI3* show in Lier, Belgium.